Polyphagous Shot Hole Borer (PSHB), Euwallacea sp. 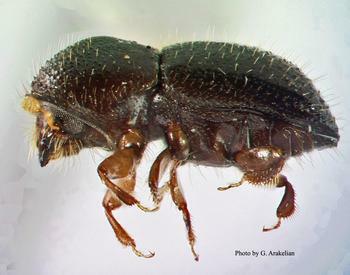 is an invasive beetle that attacks dozens of common native and landscape trees. The tiny beetle tunnels into host trees and spreads Fusarium Dieback (FD), a disease know to infect over 110 tree species. FD is caused by Fusarium euwallaceae, a fungus that disrupts the transport of water and nutrients in the tree, leading to branch dieback and overall decline. Experts believe the beetles were introduced into southern California via products and/or shipping material from southeast Asia. These beetle species have been identified in Taiwan, Vietnam and China; however, the specific origin is unclear. The PSHB/FD complex is found in other locations including avocado trees in Israel. PSHB/FD was first found at Whittier Narrows in Los Angeles County in 2003. From 2003-2010 the beetle was found on a few ornamental trees, then in 2010 it was the presumptive cause of the death of a large number of box elder street trees in Long Beach. In 2012 the beetle was collected from a backyard avocado tree in South Gate, and from several tree species at local botanical gardens. It now appears to be established in Los Angeles, Orange, and Riverside Counties. A single beetle was caught in Santa Cruz County in 2014. KSHB/FD was confirmed to be attacking avocado trees in several commercial groves in north San Diego County in 2014 as well as several species of landscape trees in a single area in east San Diego County. In 2015, a large-scale infestation was identified in the southwestern area of the County at a public regional park. 1 Dimson, M., Kabashima, J., Eskalen, A. (2015). Polyphagous Shot Hole Borer + Fusarium Dieback: Identifying Symptoms and Look-Alike Pests. [Brochure]. n.c.: University of California Agriculture and Natural Resources.